Today, I get to leave work 3 hours early. My company is pretty awesome. Did I say I love to work there? I do. Anyway, they let everyone goes home early to start the holiday weekend. Since I have a few hours to kill before picking my daughter up, I stopped by the mall to check out a few things and also beat the crowd. I know it will be crowded this weekend and most of small sizes will be gone in no time. I ended up did not get anything just because I think I have enough denim in my closet. If you are on the hunt for a perfect jeans, this would be such a great deal (buy one, get one 50% off plus additional 20% plus free shipping with code 57345217). These jeans would cost $27.00 each. Next stop is LOFT, I was disappointed to find only 2 items in my size. I purchased this Cascade Ruffle Country Floral Shell for $18.00 ($29.99 plus 40% off). That's it for me today. I am sure there will be more shopping this weekend. Enjoy your long weekend, everyone and happy shopping! 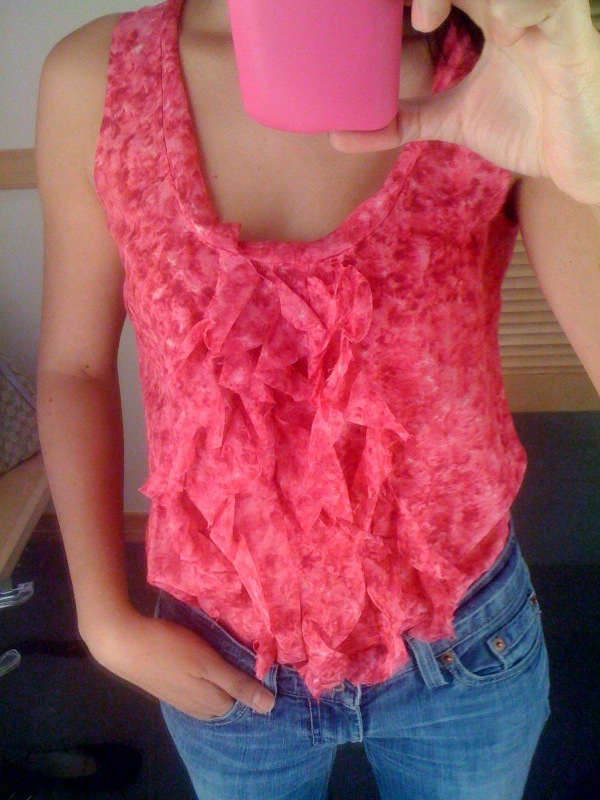 Love the coral shirt! 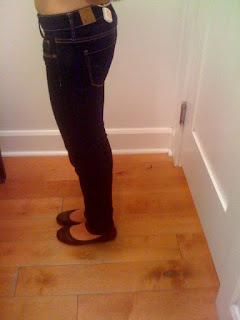 And I do like how the AE skinny jeans fir you length wise too! Sometimes the "short" is too short for me but AE is usually pretty good! I like the looks of that second pair! Gee! Those skinny jeans look so good on you! I like both pairs actually on you. You have super slender legs, I think you look really good in skinny pants/jeans. Glad the weekend is here! have fun shopping! ooo, I really like the new ruffle top you got, it photographs really well. 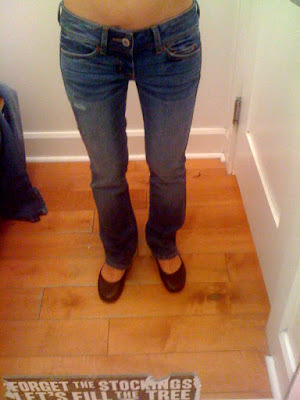 Those AE jeans look really great on you, like Ping said, you have the legs to pull them off! Have a great weekend. The skinny jeans look pretty good on you! I have that pink ruffle top too (for $20), can't decide if I should keep or return because it's pretty low-cut on me, needs a cami underneath. I'm still hoping to find that black dress (all sold out online! ), which is awesome at that price, since I don't have anything similar yet. The pants were so flattering on you, I loved both of them! Love the cascade ruffle top, what a great deal...it's completly sold out in xxsp here :( Also, the gray top with ruffles and bow was very pretty(I haven't seen it in my stores or online yet). Oh man, I can't believe how long those are even in short! Now I have a bad feeling about the jeggings I ordered in 00 regular...I'm sure they will be a foot too long and I won't want to pay for a hem. Good find at LOFT! I didn't even bother lookin in the sale section the other day since I'm so focused on Fall arrivals : ) Have a great weekend with your fam! They look GREAT on you! You are soo thin you look great in skinny jeans. I look disgusting in skinny jeans..lol! @PetiteXXS: If you still interested in that dress, I suggest you check your local stores. The store that I went to today had two 00P left which is unusual. Good deal of those dresses! @Calladra: I am not sure why that gray top isn't available online. It must be a new arrival (still pricey though). @April: Aww..you do not look disgusting in skinny jeans. You always look stunning in your videos. Have a great weekend! Wow I really love the skinny jeans! I've never tried AE jeans but you have definitely made me wanna try some on next time I'm near one! Oh I love the ruffles/bow top on you. I wish I can do skinnies! Nice Blog, i like very much!!! Loving that first pair of jeans!! 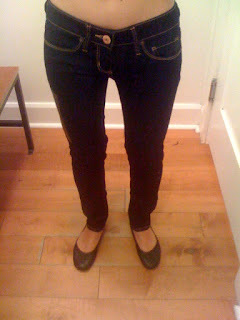 I still get a bit of waist gap with AE 00 jeans. :( I can never find a "perfect" fitting pair of jeans. I like Guess jeans because they come in size 23 though! I'm glad you got that pink top, it looks really pretty on you. The gray top is gorgeous, I may have to go search for that top at my local store. That's so sweet of your company to let you off work 3 hours early. The AE jeans look great! They actually look like the pair of Nudie jeans I've been dying to purchase. P.S. the dress from my post is from French Connection! You can still probably find it. I know that they have it on Asos (in white as well). 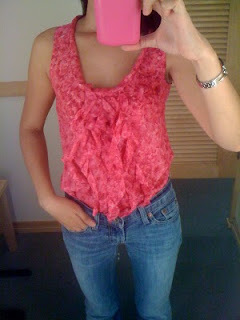 I really like American Eagle jeans! I have a darker version of the second one you tried on (the slim boot) in 00R and mine are also stretchy. I probably should have gotten them in a short, as the regular is a bit too long.